A total of 3 matches were held today in the ongoing Hockey Champions Trophy ’18, between – Argentina Vs Pakistan, India Vs Belgium and Netherlands Vs Australia. The match wise brief is appended below. Finally, Pakistan Hockey channeled their inner talent on the Hockey field and broke their win-less streak in the Hockey Champions Trophy to earn a convincing win over the World No 2, Argentina. Irfan opened the scoring to put Pakistan in the lead but Argentina’s Pardes Matias equalized the scoreboard in the 2nd quarter of the match. No goals were scored in the 3rd quarter as the match was evenly poised. Now, the 4th and final quarter went underway. This is when Pakistan displayed their best play of the match as Ali, Ahmad and Bilal struck in a periodic fashion to hand Argentina a thumping defeat. World number 13 Pakistan outclasses world number 2 Argentina 4-1 in Champions Trophy Hockey. Brilliant performance by Pakistan. Good to see green-shirts doing well. Congratulations. – finally a refreshing news from the field hockey 🏑 as Pakistan beat Argentina in the CT game ..
Once again Harmanpreet lead from the front as his early goal put India in the lead. Numerous penalty corners and chances were gifted each team to the other one. But neither Belgium nor India was being able to convert them into goals. India’s goalkeeper had done a wonderful job to keep Belgians at bay. But in the last minute of the match Luypaert Loick finally snuck through to equalize the scoreboard and the match ended in a draw. India’s fine rhythm of defending faces a setback as Belgium find the back of the net in the penultimate minute to end the #INDvBEL match with a draw. Special mention goes to @16Sreejesh who conceded just one goal from 12 PCs. 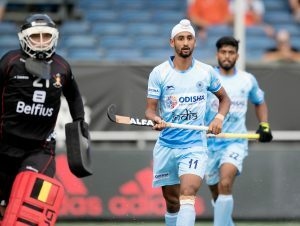 Beating Argentina, Pakistan and drawing with Belgium thanks to @16Sreejesh and losing a close one to Australia, good signs for Indian hockey under Harender Singh. @16Sreejesh was brilliant today. Australia remained unbeaten in this tournament and a win over Netherlands ensured that they kept their position at the top of the table. Although, the opening goal was scored by the Dutch side, however, Australia were quick to equalize the scoreboard as the match was evenly poised at the end of the 2nd quarter. 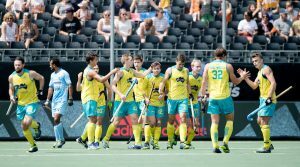 The Dutch couldn’t score a single goal in the remaining match as Govers Blake double strike won the match for Australia. Next articleBreaking World Cup 2018 – England Vs Belgium: And the Winner is…?